The science of nest-box construction is fascinating. The size and position of the entrance hole and the depth, length and width of the box all influence which fauna select what residence. 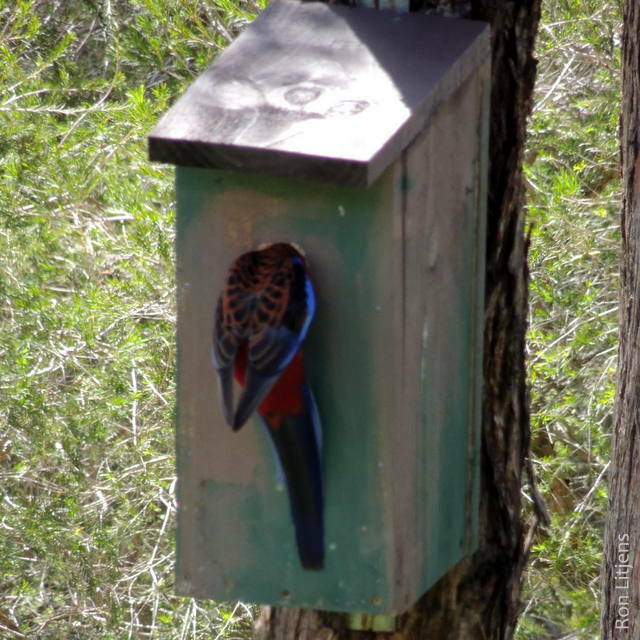 After the 2009 fires I, like many landholders in the King Parrot Creek valley, was supplied with nest-boxes to install on my property to replace the natural hollows which had been destroyed by the bushfires. Over the years this blog has reported on the many tenancies these nest-boxes have had. Some nest-boxes have been popular, some have not. The rosella nest-box has had a revolving tenancy each year of White-throated Treecreepers, Australian Owlet-nightjars (ONJ) and both Ring-tailed and Brush-tailed Possums. Rosellas for the past seven years have been repeatedly trying to get into a Sugar Glider nest-box. The entrance hole is too small but that has not stopped them from spending many hours trying to gnaw a bigger one (see photo left). The Brush-tailed Phascogale nest-box has been occupied occasionally by Sugar Gliders and the two ONJ nest-boxes have never been occupied. That could be more a statement of nest-box location than design. But never has a nest-box housed the animal or bird for which it was intended – until now. A check of the phascogale nest-box this week revealed, surprise, surprise a Brush-tailed Phascogale (Phascogale tapoatafa), pictured above. The animal was curled up in a cylinder of leaves. Macwake informs me that it was probably a recent arrival in the box as the nesting material and design is that of Sugar Gliders. Phascogales prefer nests of shredded bark and their own scats. 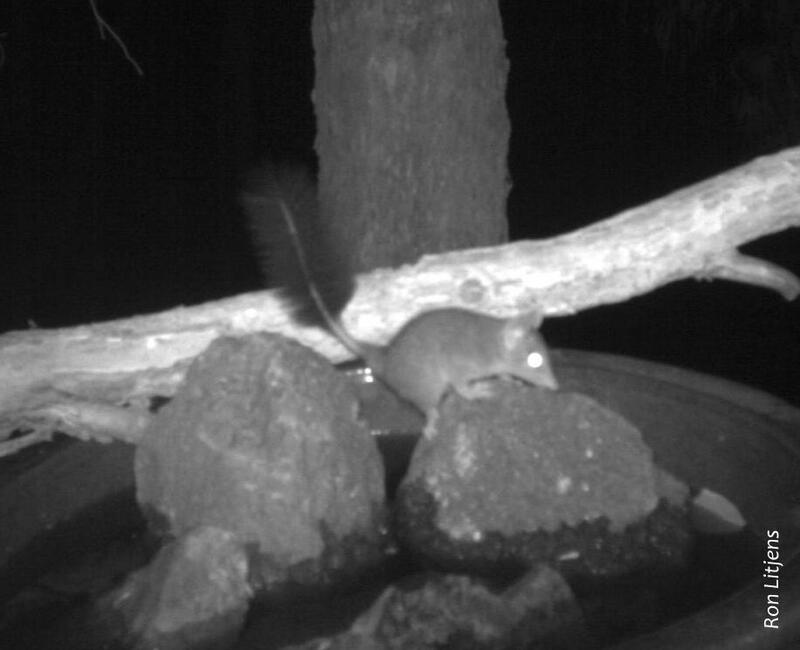 Brush-tailed Phascogales are regularly photographed by motion-sensing cameras on our property. They are frequent visitors to our bird-bath at night (pictured right) and individuals can be identified by their appearance e.g. shredded tail, white marking on the flanks. But we have never had one in a nest-box. 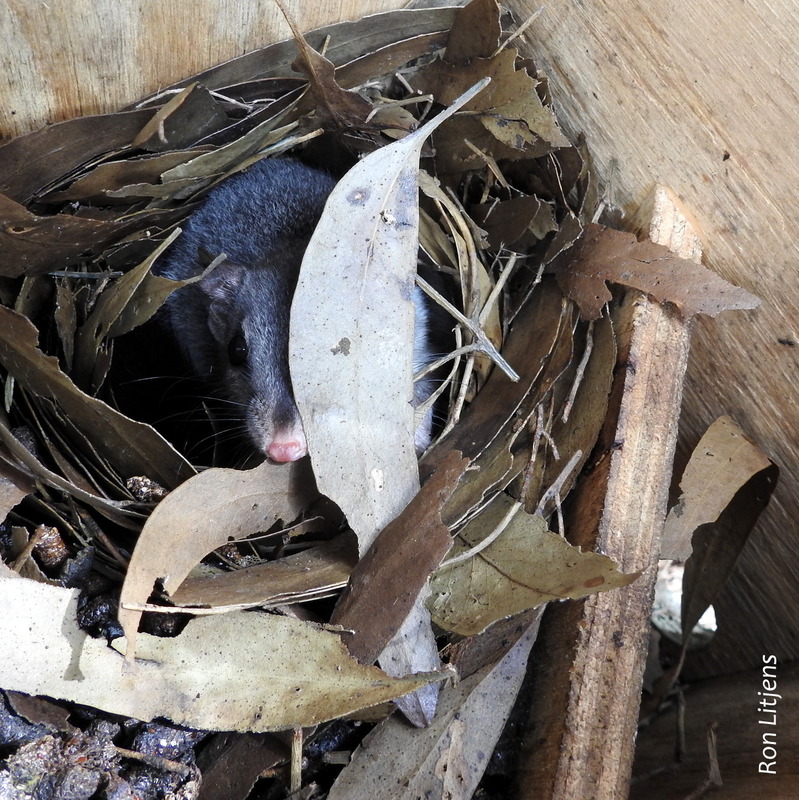 My expectation, now that the phascogale has moved in, is that the displaced Sugar Gliders will occupy the Sugar Glider nestbox and relieve the rosellas of the futile efforts they are making to widen the entrance hole. The rosellas in turn should move into the rosella nest-box displacing the treecreepers, ONJ and possums. Where will they sleep? Looks like the next project is to build more nest-boxes – of the correct design, of course. great story Ron and photos!